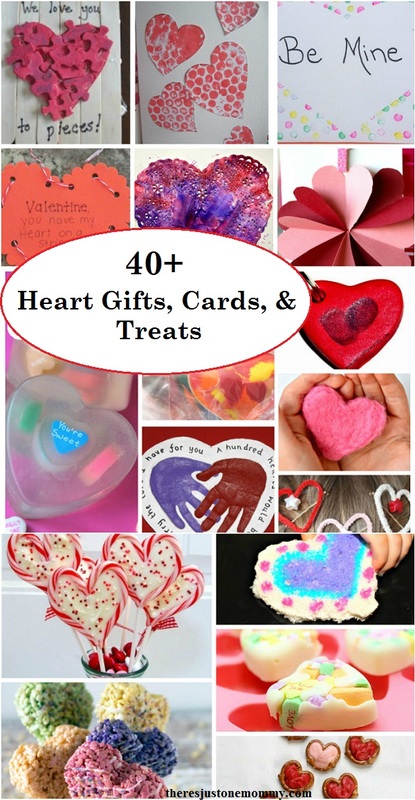 Recently I shared over 50 awesome heart crafts and activities, perfect for Valentine’s Day. 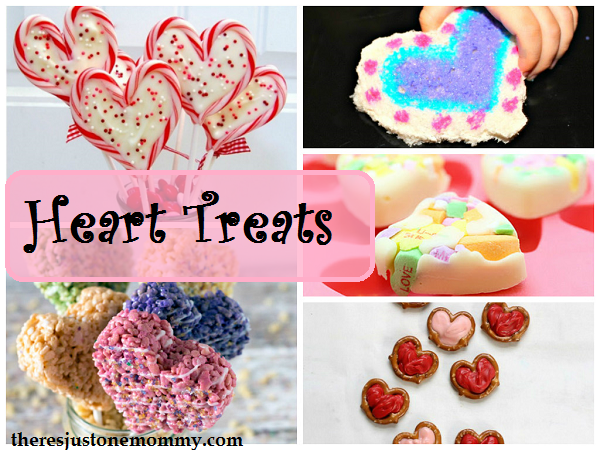 Today I have more terrific heart ideas, with some cute DIY heart gift ideas, heart-themed cards, and some tasty heart treats. 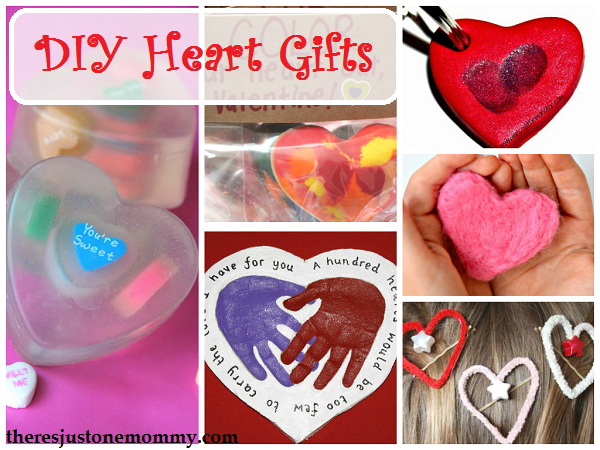 Looking for a fun heart-themed gift your child can give grandparents or teachers this year? These DIY Valentine’s Day gifts are perfect for little ones to make. These Melted Crayon Hearts are a great use for those broken crayons! A DIY Heart Mug would make a great gift for Daddy to have at work! This Felt Heart can be used to hold small candy hearts, or tuck a cute Valentine card inside! These Wool Hearts are sure to please! These Scented Felt Hearts are perfect for kids to tuck into a pocket for when they need help calming down. Conversation Heart Soap would make a cute teacher gift. Plus, I bet it will inspire the kids to wash hands more often! This Heart-Shaped Salt Dough Candle Holder takes salt dough crafts up a notch! These Pipe Cleaner Hearts have so many fun uses! Heart Bookmarks would be a great addition to those classroom Valentines. These Heart Pencil Toppers are cute and simple for kids to make. These Color Me Heart Friends would be cute gifts for little ones! I love this Fingerprint Heart Key Chain! Here’s a slightly different take on the Fingerprint Heart key Chain idea! These Pom-Pom Love Bugs make cute gifts! This DIY Wood Slice Bracelet would be a great Valentine’s Day craft/gift for older children to make! This Salt Dough Footprint Heart would be a great gift for a grandparent. Or, do the Salt Dough Hand Print Heart version instead! This Recycled Nuts and Bolts Valentine would be great for a father or grandfather! These Eraser Stamped Valentines are colorful and simple to make! This Lacing Heart Valentine gives the recipient something fun to do. Have a puzzle with some missing pieces? This Missing Puzzle Piece Valentine gives it a new purpose! I love these Rockin’ Homemade Valentines! Hate just tossing those pictures the kids drew? Check out this Recycled Art Work Valentines idea! These Spin Art Valentines are gorgeous! This Potato Print Valentine is simple enough for even the youngest crafters. Kids love to crumple paper; these Scrunched Tissue Paper Valentines give them a chance to do just that! This Bubble Wrap Printing Valentine’s Day Card is a great use for that bubble wrap. This Contact Paper Valentine turns out so pretty! Pop-Up Heart Valentine Cards are sure to be a hit! This Hand Print Heart would make cute homemade Valentines! This Flower by Hearts craft makes a gorgeous Valentine! Washi Tape Valentines are fun to craft. Surprise someone with a tasty Valentine’s Day treat. These heart-themed treats taste just as good as they look. Start their day right with this colorful Painted Heart Toast! These Chocolate Pretzel Hearts combine salty and sweet for a cute and yummy treat! From heart-shaped brownies to sandwiches, here are 10 things to do with a heart-shaped cookie cutter! Conversation hearts are plentiful this time of year. They are extra yummy in this Conversation Heart Bark. These Heart-Shaped Valentine Sweets look darling on top of cupcakes! Use those leftover candy canes to make these Sweetheart Pops! Who can resist these Heart-Shaped Rice Krispie Treat Pops? With so many DIY heart gifts, cards, and tasty heart treats, it will be hard to choose which to try first! How fun. Hard to believe it’s almost Valentine’s Day already. It IS hard to believe! I feel like January has just flown by! 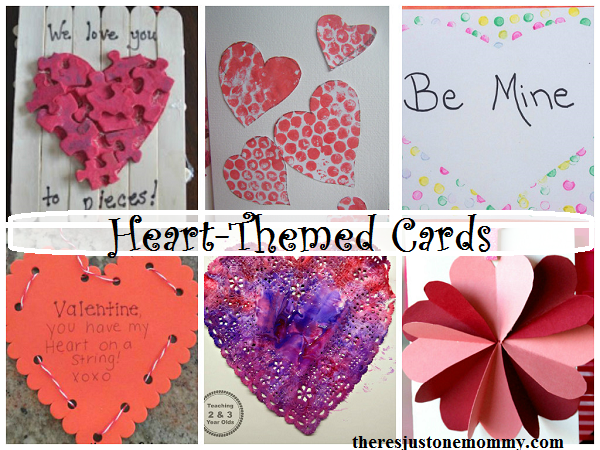 What a great resource for Valentine’s Day projects and activities! Thanks for including our Upcycled Nuts and Bolts Heart. You’ve included alot of great ideas! Pinned! Thanks so much for including our potato print cards. Thanks for stopping by…and happy crafting! I love the little fence with the puzzle pieces! I will have to try this with my granddaughter. Thanks for the idea.